The Whatcom County Youth Fair celebrates its 25th anniversary this year, scheduled for April 5-6. They are holding a youth t-shirt contest and accepting submissions. The winning entry will be used for this year’s t-shirt, and the artist receives a sweatshirt and $25. For more details, see the group’s Facebook page. Ellen Grey of the Washington Sustainable Food & Farming Network was named Advocate of the Year during the Washington State Farmers Market Association’s annual meeting. Gretchens Kitchen has started wine Wednesdays at their store in Mount Vernon. They welcome folks to come in each Wednesday from 4:30 to 6 p.m. and try different wines in the kitchen. Maybe you’ll find a bottle to take home! Farmer Walter Haugen, of F.A. Farm in Ferndale, has released a new book, The Laws of Physics Are On My Side. The book is about culture and energy, from a dual perspective of anthropology and farming. It is available directly through Haugen, or on Amazon and Kindle. Contact Haugen through his website at www.fafarm.org. Cloud Mountain Farm Center in Everson reopens for the season on Feb. 1. The center kicks off another series of educational workshops designed to support home gardeners as well as new and experienced farmers, beginning Feb. 16. They have released their annual catalog as well. For more information, visit www.cloudmountainfarmcenter.org or call (360) 966-5859. Shambala Permaculture Farm and Nursery serving Camano Island and north Snohomish County is offering limited CSA shares, including baked goods, eggs, goat milk and ferments/jams this year, right from their farm. In addition, Shambala has a variety of workshops and a permaculture design course. For more information, visit www.ShambalaFarm.com or call (360) 387-4110. Rhododendron Cafe in Bow is reopening Feb. 1. They have a new early bird pasta menu and brunch menu, and are featuring Mediterranean cooking through February. For more details see their website at www.rhodycafe.com. The Table by the Bellingham Pasta Co. has a new winter menu. Dishes include kale salad, lamb bolognese, rainbow trout, roasted red pepper gnocchi, among others, and feature local products. Northwest distilled liquors and cocktails include Bellewood Acres’ vodka and gin, Woodinville Bourbon and Dry Fly Whiskey. The Bellingham Pasta Co. has also added the Burlington Haggen store to its list of retail outlets. In addition, Grow Northwest contributor Jessamyn Tuttle has a solo photo exhibit at the restaurant during February. The 2nd annual Celebration of Food Festival is seeking vendors and volunteers. 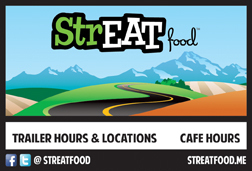 The event is sponsored by Food Revolution Snohomish County, a movement aimed at encouraging growing, cooking, preserving, and eating real healthy food. This free, family event will be held Sunday, May 19 at the Lynnwood Convention Center. This event brings together people who are passionate about delicious, local, wholesome food, said organizer Chris Hudyma. Farmers, growers, culinary professionals, youth, students, and business owners will offer activities to inspire the enjoyment of real food. For a vendor application or to volunteer, contact Festival Coordinator Chris Hudyma at chudyma@edcc.edu or (425) 640-1029. Common Threads Farm is planning a seed sale and will be offering seeds from Uprising Seeds. All proceeds benefit the group’s seed to table education. 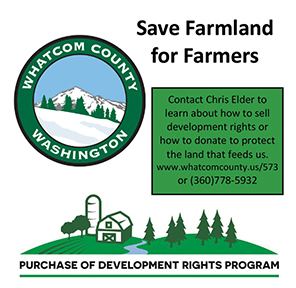 For more information, contact laura@commonthreadsfarm.org. Bellingham Farmers Market manager Caprice Teske was named to the Board of Directors for the Washington State Farmers Market Association, which held its annual conference, this year Jan. 25-27 in Vancouver. BelleWood Distilling, of Bellewood Acres, will host their first ever bottle release party on Feb. 15 featuring their first bottle of vodka distilled from honeycrisp apples. This event includes specialty cocktails with hors d’oeuvres and dessert, tastings, tours, “Bottle your Own” Gin, a DJ playing love songs “by request,” and more. Tickets are $40 per person (through Brown Paper Tickets) or $50 at the door. See bellewoodfarms.com. The Snohomish on the Rocks Distillery Festival, set for Feb. 1-2, will offer tastes from a variety of distilleries, including Snohomish’ Skip Rock Distillers. One of the sample available will be Nocino, a walnut liqueur made using walnuts from the owner’s backyard. The event will be held at the Snohomish Events Center. Tickets are $25 in advance or $30 at the door. 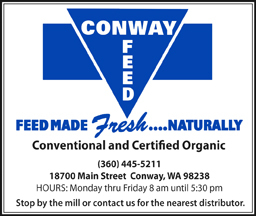 Proceeds from the event support the non-profit GROW Washington. For more information, visit www.SnohomishRocks.com. Dunbar Gardens has a basket calendar on Flickr that is available to print. February’s page is now up. See www.flickr.com/photos/dunbargardens/. Cedar Mountain Herb School has moved to rural Mt. Vernon on Highway 9. Owner Suzanne Jordan said there are lots of wild medicinals on the land at the new homestead, and invites people to come out for a workshop and enjoy the view of miles of pastureland. Check out the class information and details at www.cedarmountainherbs.com/. Dashi Noodle Bar in Bellingham has opened in its new location at 1311 N State Street, in the same building as the new Acme Farms + Kitchen and Acme FoodWorks space (which had a grand opening on Jan. 26). Dashi uses local ingredients and makes their own noodles and steam buns, broths and toppings. They’re open late! For more information, see www.dashinoodlebar.com/. Biringer Farm in Arlington has refurbished two tractors and will be on display at the Eagle Festival Saturday on Feb. 2 in Arlington. Eagle Haven Winery in Sedro-Woolley is offering a chocolate sampling on Feb. 9 from 1 to 4 p.m. Includes a small batch of Belgian chocolates produced by Seattle confectioner Keith Jackson and local J’s Nuts hand-dipped chocolate pecans. Call (360) 856-6248. Birdsview Brewing Co. in Concrete has a new beer blog. Check it out at https://birdsviewbreweryblog.wordpress.com/. Their tag is “Without beer, life is hell.” Their new growlers and pint glasses have arrived as well. Jen’s House of Chai will not be at the Bellingham Farmers Market in 2013. Sales will continue through her website at jenshouseofchai.com. Want to get away this March? A group of farmers and Extension faculty will be traveling to the country of Peru to learn about fruit and vegetable production and marketing, Altiplano Alpaca breeding, potato cultivation and marketing, and agricultural policy. Interview growers, processors, experts, researchers, officials and folks who love farming. If this is you, contact Don McMoran, Director at WSU Skagit County Extension in Burlington. 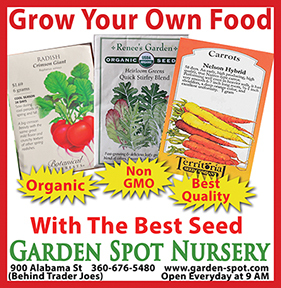 Lastly, the Co-op Garden Center at the Skagit Valley Food Co-op has a Master Seed List, with facts about open-pollinated and hybrid seeds, and some great packet descriptions. 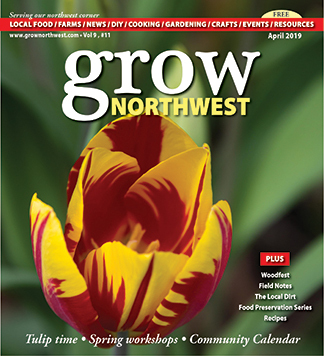 To submit items, send details to editor@grownorthwest.com. cool source of information here. reminds me of the old days of messages in the farm community.